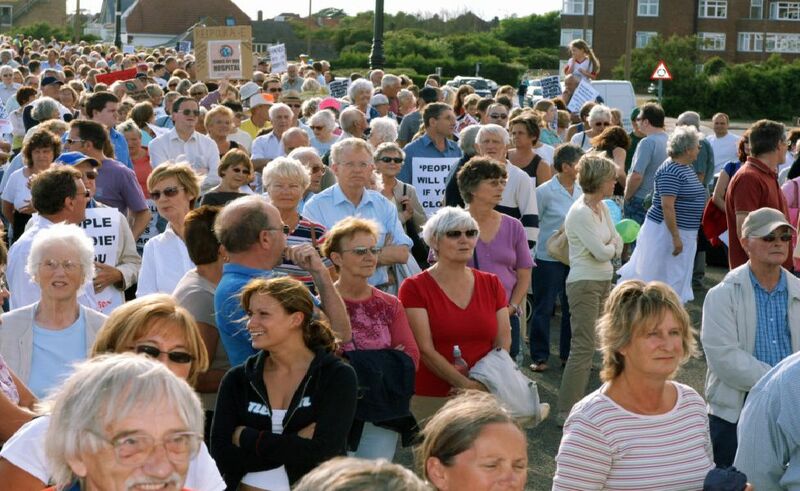 Thousands answered a call to arms to fight for Worthing Hospital in 2006 when fancy-dressed, banner waving hordes of every age, colour, size and shape marched along Worthing seafront. From George V Avenue to the west and the Aquarena to the east, two groups totalling an estimated 6,000 people converged on Worthing Pavilion for a public meeting on the threat to Worthing and Southlands hospitals. It was the highlight of the successful campaign which saw maternity and A&E services retained at both Worthing, Southlands and Chichester Hospitals. Sue Gregory with her daughters Lauren (left) and Rachel. Making a noise..Drummers Ivan and Janice Mitchell. MP Peter Bottomley with the marchers on the promenade at George V Avenue.